ABC11 Together is partnering with a local blogger to encourage everyone to do 25 Days of Kindness this year starting December 1. It's a way for people to give back and encourage selflessness during the holidays. You can share you act of kindness on social media using #TriKind25 and #ABC11. 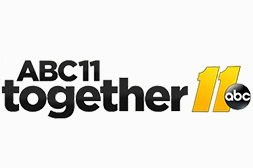 Here's a calendar for ideas from ABC11's local partner, Molly Stillman. Stillman is a life and style blogger who wanted to start this tradition with her family. She says Christmas is about giving to others and showing what it means to serve and love. She writes for StillBeingMolly.com about fashion, beauty, parenting, and everything in-between. She focuses on brands that make a positive impact in the world. "It's something that just fires me up," she said. "I love seeing people treated with kindness. I love seeing people treated with dignity and respect." She's a mom of two little ones and believes she needs to start teaching them now to be generous and kind. Last Christmas, when her daughter Lilly was just 2 years old, she created a list of 24 acts of kindness they could do every day starting Dec. 1. Here's some pictures of Lilly and her parents giving back. ABC11 will be updating this story with YOUR pictures as we get them. Read more about Molly and Lilly's acts of kindness here.